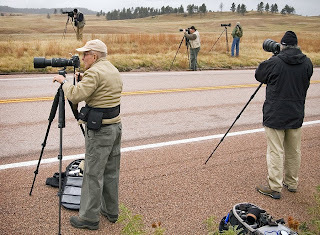 Just to prove that I'm not the only one who thinks the places I go are good for photos, here are some other photographers in action around South Dakota. 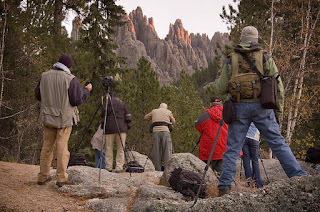 Now I don't want to discourage any photographers from visiting South Dakota due to a perception of overcrowding. That is not a problem at all here, unlike some of the very highly-visited places like Yellowstone, Yosemite and others. 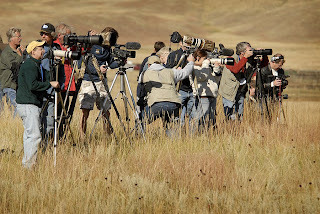 The scenes above are mostly taken during group photo tours. I typically do not run into many other photographers on any given shoot. In fact, it's a pleasant surprise when I do and we usually strike up a conversation about what we are shooting. 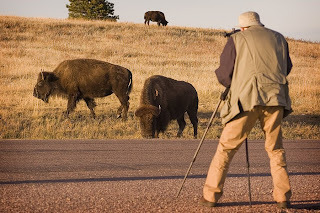 The one time a year that you will see a high concentration of photographers is the annual Custer State Park Buffalo Roundup. And I still encourage you to come, it's a great photo opportunity that you aren't going to get anywhere else. Just ask these folks who shot last year's Roundup. As one of the members of this photo mob, I can attest to what a great experience it was. The conditions for the 2008 roundup were absolutely gorgeous. Would love to come back for another crack. Well there you go! I said just ask these people, and one of them gives us the answer. Wow, i just found your site a couple of days ago, and i LOVE IT! Shows off the great state to the fullest! Thanks, and no I certainly don't mind if you spread the links around. Hey..I came across this blog on accident, but am so thankful I found it! I truly appreciate all the beautiful photography of South Dakota, not only as a resident, but also an aspiring photograher, myself. Your kind of work is exactly what I want to do for a profession. Your work is beautiful! Thanks Brooke, and thanks for adding your vote for our Photographers Rally. Hopefully we will create a really fun event soon.